Messinn's most popular dish: catfish in a creamy sauce with grapes. 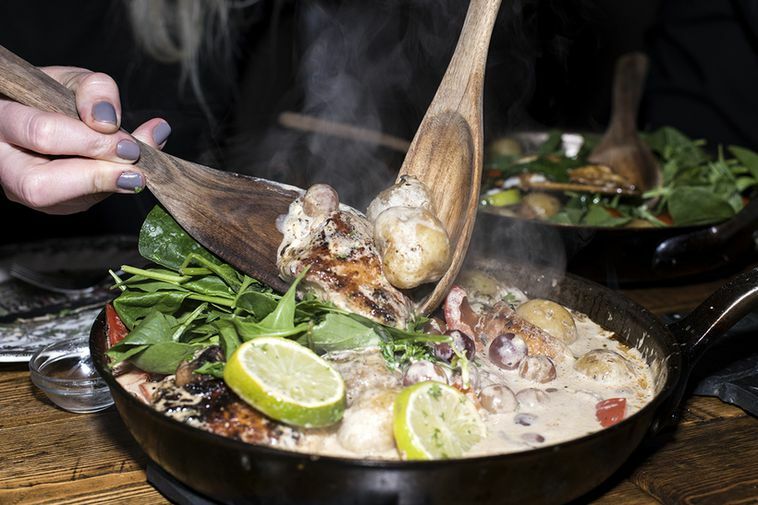 For some reason Icelanders usually eat fish on a Monday night and today we're sharing a scrumptious recipe from popular fish restaurant Messinn. Messinn opened last summer and has fast gained a great reputation for its fantastic fish courses at moderate prices. Here's the recipe for the most popular dish at Messinn, catfish with grapes and cream. The fish is coated in flour and the spices. Next, it's fried in a pan until it becomes crispy. Turn it over on the pan and add the white wine. Add teh cream and two heaped spoonfuls of cream cheese. Add the spices, the parsley and the grapes into the pan. Chef Snorri at Messinn likes to serve the dish in the pan, accompanied by raw spinach, red peppers and lime, and a glass of good white wine. For info and bookings at Messinn in Reykjavik check out their Facebook page HERE.